Much of our contemporary life is rooted in history. Our languages, our holidays and folklore, the regional dishes we cook, the houses we live in. Even on a personal level we are significantly influenced by our past experiences in life. Which friends we choose, what our favorite hobbies are, which kind of partners we seek for relationships. Much of our cultural trappings and personal lifestyle can be traced back to some point in our pasts. EVE Online is the only MMO in existence where the same statement applies. From the day the first players joined the open beta in 2003 until now, Tranquility has had an uninterrupted history of technical, game-mechanical, and – most importantly – social developments. All EVE players who have come and gone influenced that history, no matter how small their contributions were. In the very least they existed within the same continuum and have been shaped by what happened around them. If there is one thing to take away from Andrew Groen’s book, then it is the realisation just how far back some narratives go that we can still see unfolding all around us even today. Of course we have all heard stories, anecdotes and tall tales about the past from older players, but there is more to it: quite a few are still around from the days before EVE was even released. They have seen – and often participated in – the rise and fall of great in-game empires, and what they experienced influences them still. Strategies, tactics, political maneuvering, espionage, fleet doctrines, grudges and old pacts; all those things and more have developed and endured over more than a decade. I have read Empires of EVE parallel with The World of Ice and Fire which details the fictional geography and history of the world Game of Thrones is set in. The narratives of those two books often blended into each other. One may be a gritty medieval fantasy and the other a sci-fi world spanning a starcluster, but the wars, intrigues, alliances and betrayals appear similar in the impression they make on the reader. Much of this is due to Groen’s captivating writing which blends informative textbook qualities with the deft style of a journalistic correspondent, but also the engrossing complexity of the many conflicts fought in those fictional universes. There is one profound difference between those two histories though: the actors in the collective drama of New Eden are real humans and not imagined protagonists. All of them have invested time, money, their mental capacity and their emotions into this fictional world. Only a few prominent individuals of EVE’s player history are named, but behind each one of them are hundreds or even thousands of players who can read through those pages and remember where they were and what they did during the events the book describes. For others, this will be the chronicle of a past which they have so far only heard referred to by veterans of the game. 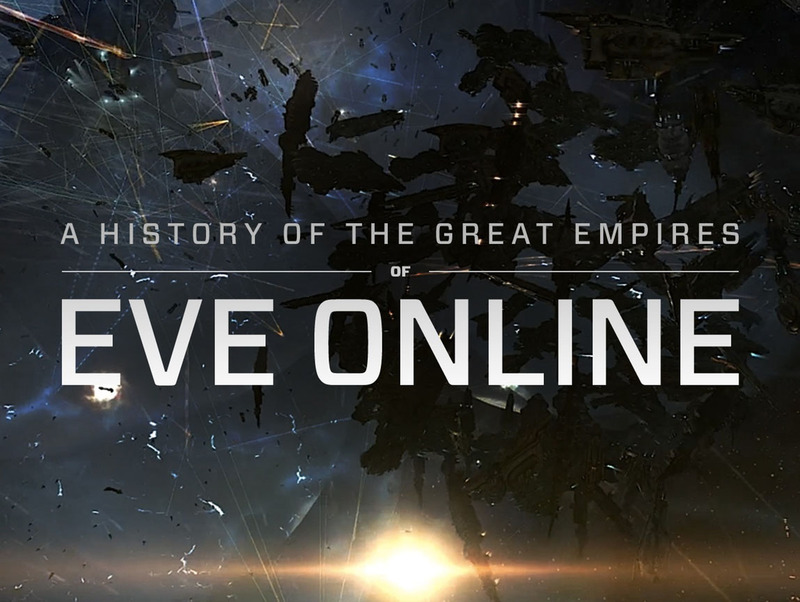 We can often read or hear one side of the old stories or another, but this is the first time so many narratives have been collected and forged into a unified report about the greater powers which fought over territory and influence in EVE Online between 2003 and 2009. I started playing in early 2008, but it took until the end of that year before I arrived at the shore of this churning sea of warfare, skullduggery and almost absurd dedication which Andrew Groen tries to map out. In a way, his book ends where my own story in EVE’s sov nullsec begins, and that makes it particularly enjoyable for me. Whole groups which we now know as major players have risen, fallen and risen again since then as well. Others who still play a major role today can be found on the very first chapters of Andrew Groen’s book. The book has a lot to cover. 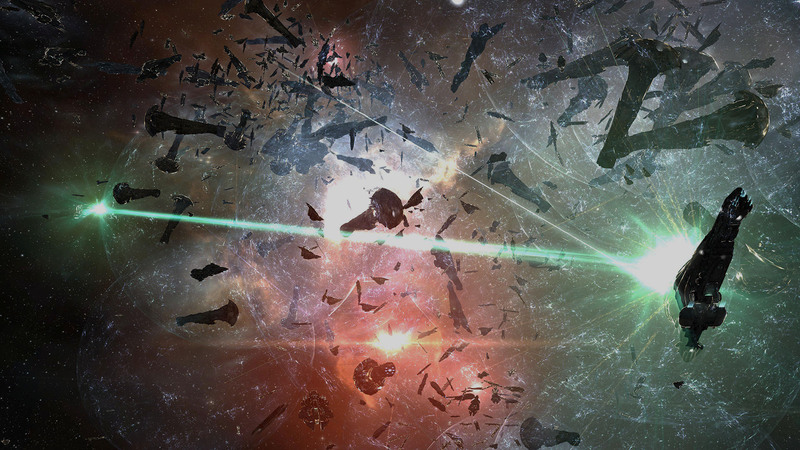 It is only halfway through that we even hear of the major powers which shaped EVE during the past five years. Only about the last third of it covers the Great War between Band of Brothers, the Mercenary Coalition, Redswarm Federation and The Northern Coalition. Before that are more than 50 pages going all the way back to “pre-history” during the Alpha and Beta stages of the game. One of the most fascinating aspects for me was that players claimed control over regions at a time when there wasn’t even a formal sovereignty mechanic. The sense of scale is also vastly different. We learn that in the days when EVE’s first “great battles” were fought, battleships were the largest weapons platform available and major strategic fleets consisted of 100 – 150 ships. Back then, battles of that size would even lead to server crashes. How far we have come since then is driven home by such mentions of the technical limitations the game had in those days. Andrew Groen does a decent job throughout to place the historical narrative in the context of the mechanics at its time. 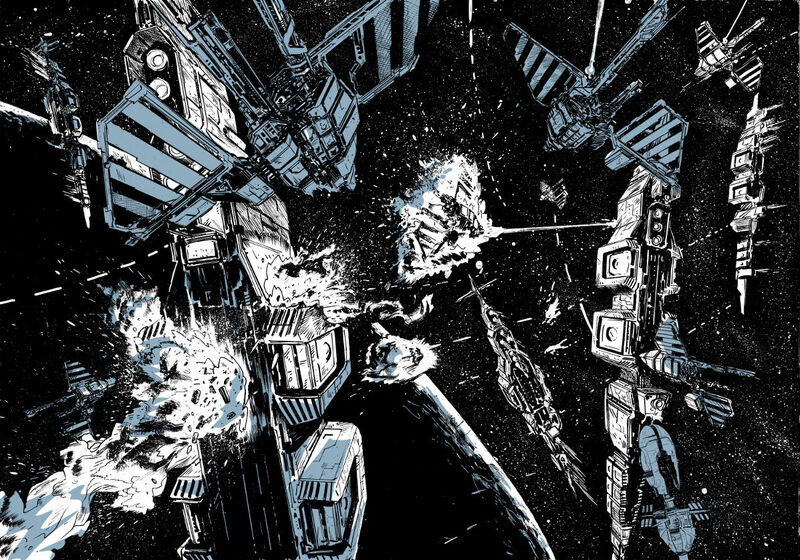 Cruise missiles on interceptors, the invention of the “gatecamp”, the infamous “Cavalry Raven” and the first “Suicide Dreads” appear in the story. Many EVE players can understand those references properly, but the explanations of specific mechanics also serve very well to explain the events to those who do not play the game or who started much later. I have not tested it, but I am certain someone who does not know or play the game would find the stories just as compelling without missing any of the important points. 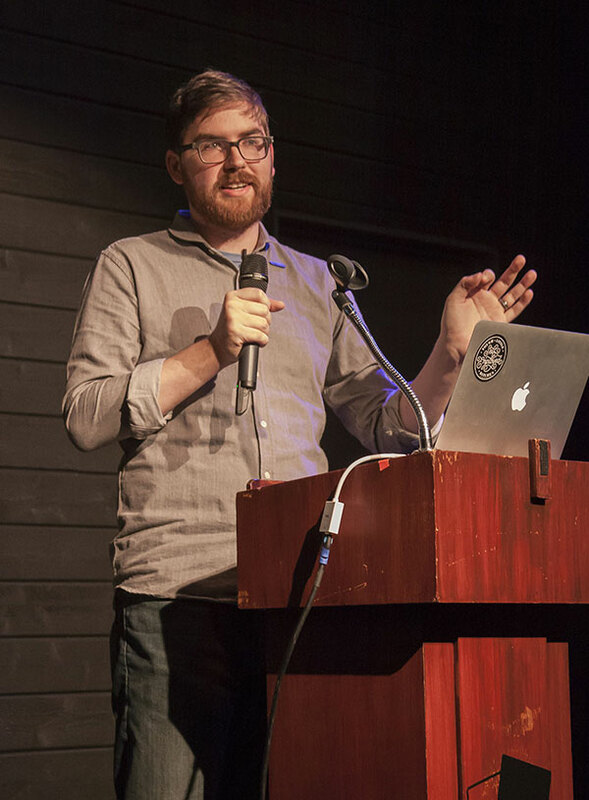 Andrew Groen has done several presentations about his work in front of audiences who are not EVE players or even gamers in general, and the book reflects his talent to bridge that gap. With the exception of a few introductory pages, he manages to do so without boring the seasoned EVE players with things they are inherently familiar with. There are several pieces of history that people will miss in this book. CVA and their allies do not appear in the story. While they may not have been stakeholders in most of the larger conflicts, I do think that they played a unique role in EVE’s history and would at least have deserved a sidebar of their own. Atlas Alliance and many members of the original Northern Coalition are only named in passing. We never learn where Tau Ceti Federation came from and what their reasons were to join Redswarm Federation. Some people who play a major role in the early chapters are never heard from again later, and we do not learn what happened with them. Much of what is motivating and driving the Russian-speaking alliances remains obscure for a large part. On one side, the author clearly faced a constraint in time and page count, on the other hand, he definitely also ran into language barriers during his research. Groen does not gloss that over though. He openly admits that a lot of the history written by predominantly Russian, French or German-speaking players remained difficult to access. Personally I am missing an index and a citation list the most. There are so many names, dates and references that it sometimes becomes difficult to keep them all in your head. Those who possess an electronic version can of course search through it, but the physical version would benefit immensely from having an index. Both the electronic and the physical version could need a reference list. There are many citations in this book, and it would be interesting to know where they are sourced from and from when exactly they are. At various points prominent individuals are quoted with dates attached to the citation, but sometimes all we get to know is that a quote came from “an interview in 2014” or “was posted on the EVE forums”. One citation goes so far as mentioning the “Uncredited source of Goonswarm historian James 315”. I could dedicate a whole paragraph to an elaboration on how wrong this is. Many have also noticed that the glossary in the end is not alphabetically ordered. Points such as these are like a splinter in my academic mind, but I do take on board that this is less a history textbook and more a historical report. Of course, there are also other more practical causes for such omissions, and they are understandable. I have heard Andrew Groen himself say that he had to finish the glossary last and by that time he was close to exhaustion and past his deadline. He acknowledged that adding an index would have been his wish too, but he simply couldn’t manage to do it anymore. In light of this, much can be forgiven. Of course, Andrew Groen earned money on this, and he earned himself a name in certain circles, but it is still a major project essentially resting on one person. As someone who has done research and publication projects I can testify that this is very hard and time-consuming work, even in the age of digital communication. I do hope that the success of the book is sufficient for the author to consider a revision where he addresses some of those shortcomings. On top of that, it would be very welcome if he managed to make a deal with Amazon that allows for shipping to Europe and elsewhere. While US citizens may be the largest single EVE playing demographic, they are still outnumbered by the collective of players elsewhere (except China who play on their own separate server). The fact that the copies available at Fanfest were sold out on the first day clearly shows that there is high demand for the book outside the US. Like I said, Empires of EVE represents the first attempt to compile a cohesive chronicle of the major conflicts that have played out in New Eden over the course of more than 13 years. The biggest eye-opener for me was that massive player organisations with thousands of accounts are not a prerequisite for engaging and captivating stories. In the early days, alliances had member counts in the hundreds and EVE as a whole had several tens of thousands of players. The 100.000 subscriber mark was only reached in 2006 and by the time Andrew Groen’s story reaches that year, it is more than halfway through. The second major lesson to be learned from this book is that in EVE history matters just as in the real world, and that there are players still active today who have not forgotten the grudges of the past. The current war has lead to several comments by older players who are still in leadership positions, how they have waited for the moment to make the Goons pay for the destruction of the Greater BoB Community and many other perceived wrongs. During the recent drama about the Snuffbox AWOX of Shadow Cartel supercaps, it has become obvious that some players still stick to values which have long been thought outdated. The often mocked ideals of “e-honour” are however not simply some roleplaying gimmick. The history Andrew Groen describes shows quite clearly how repeated betrayals and misconduct can compound up to a point where major forces ultimately unite against one dominant faction or another. This has happened to the old Phoenix Alliance, to Band of Brothers and most recently to the coalition lead by the Goons. Alliance leaders of the present and the future can gain much from studying this. Most importantly there is a lesson to be learned about the dangers of hubris. In recent times, The Mittani and his leadership cadre considered themselves the undisputed masters of sovereign space. Through repeated revisionism they sought to create a version of history that serves their narrative. In doing so, they forgot or ignored that not everyone in the game believes their version. They may have been successful in making the younger players in their coalition believe the revisionist version of history they have fed them, but others remain in the game who still remember things differently. They have not forgotten, and neither did they forgive. If there is one constant in EVE history, then it is that all great empires eventually fall as a consequence of their own arrogance, hubris, corruption or negligence to uphold their formative ideals. Should Goonswarm Federation ultimately lose the current war, then we shall see whether players from their ranks remain who can hold a grudge and wait for their moment to strike back, as their remaining enemies of old did. One thing we can be sure of: whichever power rises in their stead will eventually succumb as well if they do not learn from history. As the philosopher George Santayana said: Those who cannot remember the past are condemned to repeat it.